The weather in the Northeast has been quite a roller coaster lately. When it’s cold, it’s really cold. And when it’s warmer, it’s usually raining. New England Clam Chowder is the perfect lunch for either side of the crazy winter weather spectrum and anything in between. Warm and comforting, a steaming bowl fills you up while giving you a taste of the sea you might be missing. I found this recipe in buried my grandmother’s stack of unpublished soup recipes. John Clancy’s name was typed neatly in the top corner of the page so I’m assuming this is his recipe or a collaboration of some kind. This chowder is not as thick as what you would expect from a traditional New England Clam Chowder (and definitely not as thick as the nasty stuff in the can). That may be good or bad, depending on your preference. 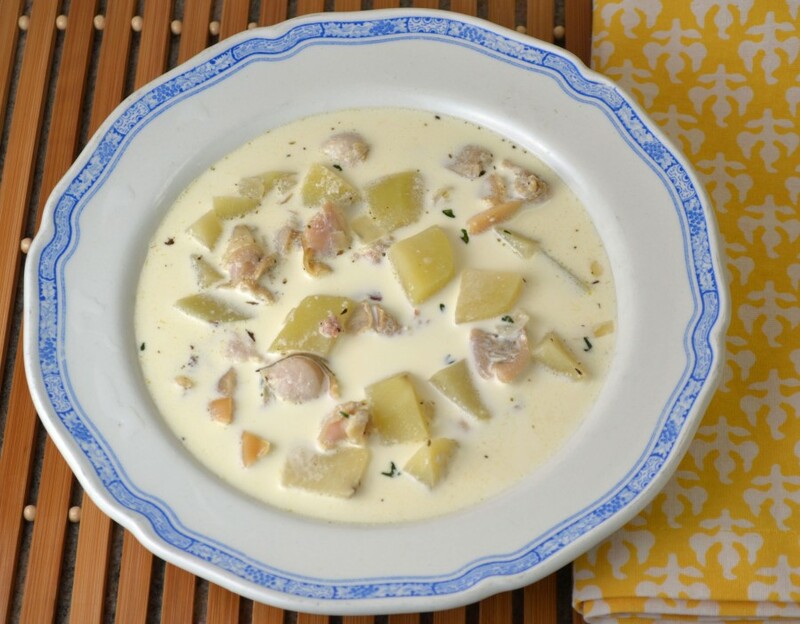 If you prefer a thicker chowder, you can simply start with a roux – add roughly 2 tablespoons butter and 2 tablespoons flour to the pan before cooking the bacon and onion. However, I believe that if you use really fresh clams (right from the shell), you won’t care about the thickness of the soup. The taste of fresh meaty clams with the smoky bacon is enough to keep you going back for more. In a large 3-4 quart saucepan, brown bacon and saute onion until golden. Add all clam juice and bring to a boil. Cook potatoes in mixture for 10 minutes or until they are tender. Add thyme, clams, and cream and simmer for 5-6 minutes (careful not let the soup boil or it may curdle). Season with ground pepper and remove sprigs (once thyme leaves have fallen off).